Easy access, villa is located just right in front of Public Road. The Alisé Villa is located in the heart of beautiful rice fields. It is completely surrounded by rice paddies and forests, in a guaranteed meditative atmosphere. You can appreciate the calm, the ZEN spirit and the beauty of its environment. The height of the land is 500 meters above the sea level, so it will have a pleasant ambient temperature and much less hot that in Denpasar. The Villa was built on the 1685 sqm land with spacious lovely garden and 400 m2 building area consisting of 2 floors. A large bedroom named Africa Room equipped with 1 king size bed (72 inches wide) facing the pool and garden, air conditioned, electric water kettle, on an adjoining private bathroom with shower, separate WC, a small dressing room with safety jewelry box. Two spacious living rooms (a TV lounge with 50 Inches UHD Smart TV (Internet TV), DVD player and Stereo set, a lounge with sofa seats of 10 persons, comfortable, facing the pool). An indoor dinning room with a table for 10 persons and a Bar area with extra fridge, microwave, toaster, electric water kettle, induction cooker, hot/cold drinking water dispenser and sink. A fully equipped kitchen below the villa in a separate building (the staff area). A magnificent huge 18 m x 8 m outdoor swimming pool surrounded by two decks. An outdoor lounge with a table for 10 persons for outdoor dining, not forget a delight sitting area (calm, assured, serenity) to enjoy at the end of the garden under a gazebo facing the rice fields. A balcony with a table and chairs for relaxing. Two identical independent 50 sqm each of private family apartments (Wooden teak JOGLO style) named "Oceania" and "Indonesia" family apartments, each apartment equipped with a large bed room with 1 king size bed (72 inches wide), 1 sofa bed (32 inches wide), 2 retractable single beds (35 inches wide / on request), air conditioned, a table and chairs, a working desk and chair, electric water kettle, a "Tropicalized" large bathroom with shower and with a stunning views of rice fields (but out of sight), a separate WC, a large dressing room with safety jewelry box and a private terrace. The villa is nestled in rice paddies but has direct access by car from the public road in front of the villa. Part of the beauty of the villa is it's natural setting, sitting in the rice paddies means we are occasionally visited by birds, frogs, lizards, harmless wasps, etc. Short Stays starting from 2 nights. Breakfast, lunch and dinner with European and Indonesian Style menu. Hi, my name is Ramli, I and my wife love to travel and visit exotic places. Anyway we found out that Bali is one of the best place to visit and to enjoy life because of its unique cultures and also the beauty of its land. Therefore I and my wife decided to purchase a villa in Bali. and after a while we decided to purchase a Villa in Ubud area, but because we don't always stay at the villa, so we decided to rent it out for other peoples, so they can also enjoy the beauty of rice fields and forest that surrounded the villa. This Villa is surrounded by magnificent view of the rice fields and forest but still not to far from the Ubud Center. The place is very quiet, calm and peaceful. So it is very good for relaxation, releasing the stress, also very good for Yoga and Meditation. In the Morning you can hear the wild birds singing and also at night the sound of the Frog Orchestra. The 6 m public road access passes exactly in front of the villa gate which provide very easy access to the villa. This Villa has a Magnificent 18 meters x 8 meters private swimming pool and also a very nice garden. This Villa also has a unique combination of the European and Authentic Javanese Wooden Teak Joglo Style architecture The villa and pool are located at the top of the plot, overlooking the site and providing a heavenly view. The Villa also has its owned secured gate private parking area for 3 to 5 cars and motorbikes. a "Tropicalized" large bathroom with shower and with a stunning views of rice fields (but out of sight) with a separate WC. Each Bed Room is equipped with Air Conditioning. Two spacious living rooms (a TV lounge with DVD and Stereo set, a lounge with sofa seats of 10 persons, comfortable, facing the pool). Breakfast, lunch and dinner with European and Indonesian Style menu is available at the Villa with additional surcharge. Each guest may choose his or her menu in advanced. The Indoor Dining Room is fit for 10 Persons and Outdoor Dining can be for 10 Persons also. Car or Motorbikes is recommended. Our Villa can also provide rented car with driver or motorbikes with additional surcharge. Laundry is available with additional surcharge upon request. The villa is nestled in rice paddies but has direct access by car from the public road in front of the villa. Part of the beauty of the villa is it's natural setting, sitting in the rice paddies means we are occasionally visited by birds, frogs, lizards, harmless wasps etc. We had an amazing stay at the Villa Alise! All of the reviews and pictures were spot on! Ramli was a great host with a great staff. He had the driver there for us at the airport and dinner was waiting for us when we arrived. The house was big and comfortable, with really cool outdoor showers that looked out over the rice paddies. The house is actually surrounded by rice paddies. It is such a surreal and magical setting, where you feel as one with nature. Magical, because you are off the beaten path in the countryside, with many small villages. There just happened to be many weddings and festivals going on, so you hear the chanting and prayers in the background with sounds of the chirping crickets and singing birds. We really prefer being away from the tourist scene and enjoyed being at the Villa. We are a family of 4, so we used the driver every day. Our driver, Nyoman was outstanding! He took care of us and knew all the best places without trying to steer us to places just to get a kick back. Trust is huge for us, and he was very trustworthy. We even used him on other parts of the trip. It is Bali, so you always have to expect that there will be bugs and other things that come up. However, the bugs never bothered us. We often left the windows open to get a cool and refreshing breeze. We had a lizard in the closet (it startled me at first) that became like our pet. It and the geckos did a number on the mosquitoes. If things did come, the staff promptly took care of it. The pool was our savior after a hot humid day exploring. The pump was out the first day, but it didn’t matter, still a great pool. We cooked most of our meals, but the meals we did have at the Vllla were good and not expensive. Our kids had plenty to keep them occupied from the pool, to hiking around rice paddies, to playing with neighborhood dogs. I highly recommend the Vllla Alise and would stay here again. The best VRBO experience ever! Thank you for writing such a wonderful 5 stars review of your stay at Alise Villa. I am so glad that the villa met with your expectations and that you enjoyed your stay in the Alise villa. Villa Alise is a jewel in the middle of rice fields North of Ubud, Bali. From the heart I will say thank you for choosing to stay with us. Thank you for writing such a wonderful 5 stars review of your stay at Alise Villa. I am so glad that the villa met with your expectations and that you enjoyed your stay in the villa. All the staffs here are very much looking forward to seeing you when you plan to stay again at Alise villa in the future. After leaving Alise Villa, we checked in to our next hotel and were less then pleased. It was so bad that we forfeited our money for the next two nights and went back to Alise Villa. They allowed an early check in and when had lunch ready within 2 hours upon arrival. Iluh is a fabulous cook and the polet Alise is delicious. In my review with our first stay, I forgot to mention they do laundry which was fabulous. The only thing holding me back from 5 stars is the hard beds and couches. The foutons however are very soft and comfortable. 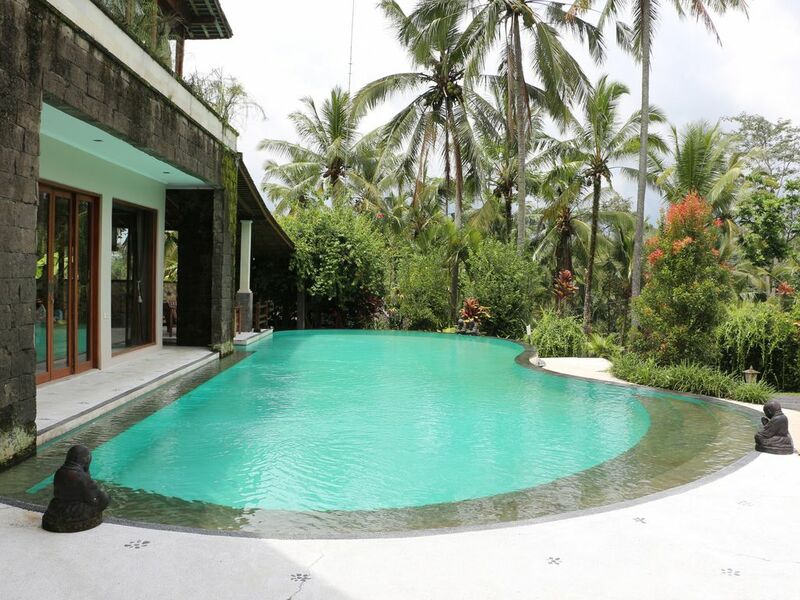 It is maybe a 20 minute drive to Ubud center, but this is why we choose the villa. It was so quiet, but everything was very accessible. If possible, I would request Nyoman as your driver. He is very kind and thoughtful. Thanks again to everyone at Alise Villa for allowing us to come back so last minute and being so willing to continue to make our vacation memorable. Thank you for your choice to stay back at the Alise Villa and thank you for your kind review. We will always try to do our best for our guests and we are glad to hear that you enjoyed your stay at the Alise villa. Regarding the beds, they are actually Medium firm type mattress beds, the beds are not too soft but also not too firm. My husband and I stayed here for four nights and it was fantastic. The pictures are true to what it looks like. It is about a 30 min drive from Ubud center, which is fine because we wanted to stay away from the hustle. Iluh is a great cook with meals nearly on time. The internet went down twice during our stay, but it was up and running within 10 minutes. The outdoor shower was glorious after swimming in the pool. Nyoman was our driver hired by Made and was nothing short of perfect. Since you are in the middle of the jungle, there are animal/bug noises at night, but only noises. The geckos are around the house, but never bother you and keep the misquitos away. Each bedroom even had a power cord that was compatible with our USA plugs! We were never left wanting here. The only downfall was the hard beds at night and the equally hard sofas downstairs. Including transport from the airport, driving around every day we were there and transport to our next hotel, we only spent 1.5 million IDR. We also ate nearly every meal at the villa and spent Only 1.3 million IDR. Well worth the money spent. We were able to watch the locals planting rice right from the balcony. All in all I would for sure recommend this Villa to anyone. Thank you so much Made and Iluh for having us and treating us so well. Thank you for having chosen to stay at Alise villa and for your kind review. Your positive feedback is very much appreciated. It is very pleasing for me to know that you and your husband thoroughly enjoyed your time at the villa and that all the staff took good care of you. I do hope that you will have another chance to visit Bali and stay at Alise Villa again sometime in the future. We really enjoyed our stay here, such a beautiful roomy villa with an amazing pool ! Hassle free stay the staff where all lovely and helpful. The villa is in the countryside, and the surrounding area magnificent rice fields and forest. We felt privileged when participating in the harvesting activities with local farmers just side by side of the villa garden. Obviously, you do need a transportation system to reach Ubud and to do every planned activities in your holidays, but the sensation of quietness and relax, away from the crowd, rewards you. Fully recommendable. Thank you for your choice to stay at the Alise Villa and thank you for your kind review. We will always try to do our best for our guests and we are glad to hear that you enjoy your stay and hope to have you back in the future.